Mastodon vocalist/guitarist Brent Hinds proposed to his girlfriend Raísa Moreno on stage during the band's April 28 show at Iron City in Birmingham, AL, and video of the event has surfaced online. Hinds delivered his proposal at the end of the concert, while his grandmother watched from her seat on stage after rocking out during the evening. Recorded last year with producer Brendan O’Brien at the Quarry in Kennesaw, GA, the project recently scored a US Top 10 debut when it entered the Billboard 200 at No. 7. 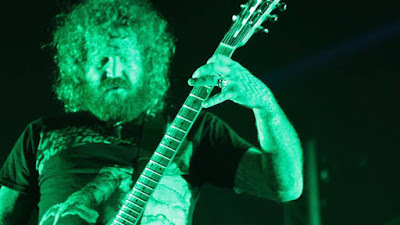 Mastodon’s spring tour with Eagles Of Death Metal and Russian Circles wraps up in Austin, TX on May 20; following a two-week break, the group will launch a European trek with an appearance at the UK’s Download Festival on June 9.